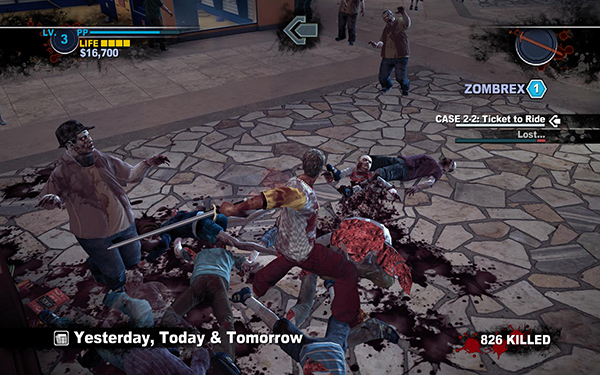 There’s one clear message I can say that I took away from Blue Castle’s sandbox zombie sequel, Dead Rising 2, and it’s this: dildos are perfectly acceptable forms of weaponry in the event of a zombie apocalypse. 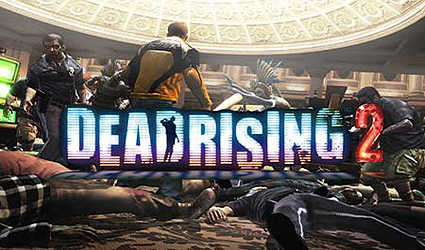 The first thing that came to mind when I started to delve into Dead Rising 2 was, “this is totally Just Cause 2 with zombies and much better weapon variety,” and my final impressions aren’t too far from my initial ones. This game is blissful mindless fun. So much so that it pains me to have to point out how damaged the game’s core is due to a few poor design choices and bugs. First of all, there are no checkpoints. Zero. Old school gamers may scoff at this, crying out that gamers today have grown soft and simply can’t take a challenge. To that I say: a bewilderingly poor design choice does not make any game more difficult, especially not in a persistent world wherein one can invest hours upon hours in forward progress only to have the wind knocked out of them with a single death. What makes this even less forgivable is that is that all signs point to this game focusing more on the fun of being thrown into a world populated by the living dead, an insane assortment of weapons to combine together, and a sandbox environment, and not the gravity of surviving the zombie apocalypse. In other words, I’m getting mixed messages from the game. Does it want to be a mindless zombie massacre or a heavy-toned survival challenge? Players can manually save by running off to bathrooms scattered about Fortune City, but you can (and likely will at least once) die while en route to save on some occasions. 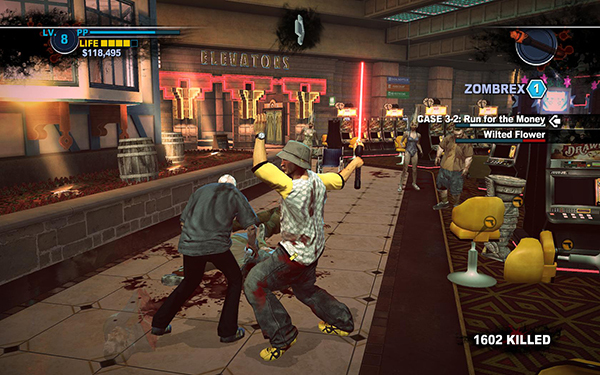 I’m a big fan of challenging games; this element didn’t make Dead Rising 2 hard by any stretch of the imagination, it just made it occasionally miserable. Combine this with some semi-frequent freezing and crashing, and the occasional drop through the world, and you can see why this might be a problem. The story follows Chuck Greene, a former motocross star, as he attempts to prove his innocence in a conspiracy that draws some surprising and interesting parallels to the era of Joseph McCarthy and the red scare, except with way more zombies. In the process of doing so he also needs to collect several doses of Zombrex to keep his infected daughter from turning zombie herself, and he only has 72 hours to accomplish all of this. Before I talk about the time constraints, I’d like to point out one little peculiarity that consistently managed to bug the hell out of me: Chuck is way too comfortable with leaving his daughter with random strangers who offer to look after her. That aside, the time constraints (and even the save system) can be a pro or con depending on your personal preference. Your missions, along with your daughter’s daily dose of Zombrex, are all on strict deadlines which must be met in order for the story to progress. If you miss one deadline, you’ll have to start over to finish the story (with your stats intact, thankfully). You still have 72 hours (game time) to roam the game, but there is no dedicated sandbox mode that switches the time constraints off entirely. Doing all of the side missions, escorts, and boss fights against some outstandingly perverse and macabre characters, along with some of the more long term achievements, will almost certainly take a few playthroughs if you’re trying to stick with the story deadlines. Fortunately you can continue to play through optional side missions and free roam even if you fail at the story once, making the time constraints feel much less harsh. As I said before, your stats stay intact when you start a fresh playthrough, making the choice to spend some time leveling up all the more prudent and practical. Unfortunately, Prestige Points, the games EXP system, saddles the game with a bit of grindy feel. On the other hand, it also adds some direction and encourages you to explore and find things to do other than kill zombies (like shoot giant craps). What makes accruing PP feel like a grind, however, is how vital a role it plays. Your level determines what special moves you can perform, such as the often pivotal dodge roll, how much health you have, how much damage you can do, how far you can throw things, how many inventory spaces you have access to (4 to start, and much more far down the road), and which combo cards you can get. Fortunately though, you don’t need to possess a given combo card to combine the two items specific to it. For example, I can combine a bowie knife and boxing gloves even without possessing the Knife Gloves card. If you do possess the card you gain a slight PP bonus when you use the weapon to kill. And if there is anything that makes this game stand out, it’s the combo cards and the MacGyver-like sense of ingenuity that comes from having the presence of mind to combine a super soaker and fireworks to cobble together a makeshift flamethrower while in a tight spot. Individual objects you pick up in the world, and there are a lot of them, offer up satisfyingly diverse ways of slaughtering zombies on their own, but when you can combine a grenade and a football, or a car battery and a wheelchair, or a chainsaw and a kayak oar into something resembling Darth Maul’s lightsaber, it’s something else entirely. 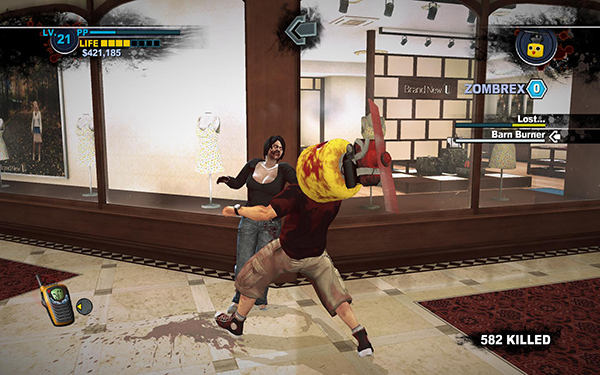 Dead Rising 2’s foundation relies on this facet of terrifically visceral combat and creativity. It’s fetish fuel for sadists, and it’s the part of the game that makes the frustration worth it. 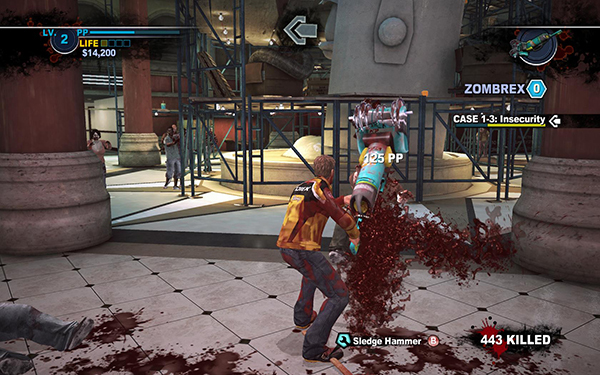 Second in fun-factor to the murderous creativity that this game is founded on is its highly unique multiplayer known affectionately as ‘Terror Is Reality’. I’ve already compared Dead Rising 2 to a few different things (if those things had zombies), and I’m about to do it again. Terror Is Reality can best be described as Mario Party with, surprise surprise, zombies. Four players take part in 3 random mini games, each being equal parts contrived and fun, such as ‘Zomboni’ in which players riding zambonis crush zombies to fill their rigs up with blood which they can then shoot at targets to gain point, to win money and determine the rankings for the final round of slicycles, the best part of the whole game. 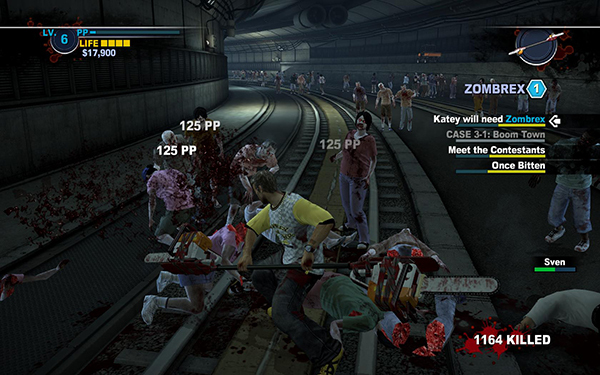 In slicycles, players ride dirt bikes with chainsaws sticking out of either side of the bike like airplane wings, killing as many zombies as possible to rack points up before time expires. Each player earns money that can be put directly towards their playthrough of the game. It should also be noted that this is the only viable way of earning a lot of money quickly. But even the multiplayer seems to be flawed. For one, there is no host migration and there are already an abundance of rage quitters who delight in throwing tantrums if they are so much as ranked in 2nd place after the first mini-game. Secondly, there is no way to mute other players, nor can you mute your own microphone without unplugging it entirely. Before I start to close out, I’d also like to bring to your attention that many players on the PC version are struggling to get wired controllers to work, and nobody who I have spoken with has been able to get a wireless controller to work at all. While I’d love to be able to say that Dead Rising 2 is so fun that it ranks as a superb game, that simply isn’t the truth. It’s a strong effort, certainly strong enough to stand on its own two feet, but it walks with a very apparent limp. What could have been a superb romp through a persistent zombie-filled world feels hamstrung. Still, it’s worth saying that if you can tolerate the game’s numerous missteps, you will have a truly enjoyable experience on your hand that will definitely be worth a spot on your shelf or Steam account. I was able to look past these flaws to an extent and lose myself in this game, but many may struggle to do the same.